The Nimitz-class aircraft carrier USS Carl Vinson and the Indian navy replenishment oiler INS Shakti conduct a refueling at sea exercise. Carl Vinson and Carrier Air Wing were deployed in the Malabar Exercise. India may have quadrilateral military exercises with the United States, Japan and Australia in the Indian Ocean in the coming years, a former Indian foreign secretary told an audience in Washington, D.C. Thursday. The quadrilateral security dialogue – or ‘quad’ – was a short-lived initiative in 2007 where the assistant secretary-level diplomats from the United States, Japan, India and Australia met on the sidelines of the ASEAN Regional Forum. Though initiative died after one meeting – largely due to fears from China over perceived containment – some have called for its revival amid an even greater convergence among the Asia-Pacific giants, particularly in the wake of growing concerns about China’s rise. Speaking at The Heritage Foundation, a Washington, D.C.-based think tank, on Tuesday, Kanwal Sibal, who previously served as Indian foreign secretary, expressed optimism at this convergence, suggesting that there may even be military exercises between the four countries in the next few years. “To my mind, this is a step-by-step process, and I won’t be surprised if at some stage we also have the quadrilateral exercises in the Indian Ocean,” Sibal, who now serves as dean of the Center for International Relations and Diplomacy at the Vivekananda International Foundation, a New Delhi-based think tank, told the audience. The four countries already did exercise together along with Singapore as part of Exercise MALABAR – which initially began as a bilateral naval exercise between the United States and India – back in 2007. While expanded exercises with all four countries have not occurred since then, as Sibal pointed out, there are already some signs that things are slowly moving in that direction. 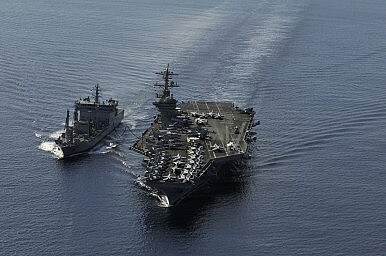 Last month, Japan participated and was made a permanent member of the Malabar exercises, a move which U.S. officials had been pushing for years (See: “US Official Calls for Permanent Expansion of Malabar Exercises with India”). Australia, meanwhile, has also already publicly expressed interest in joining the United States, India and Japan in exercises in the Indian Ocean (See: “Australia Wants to Join India, US and Japan in Naval Exercises: Defense Minister”). In September, Australia and India also held their first ever bilateral maritime exercise, AUSINDEX in a significant boost for defense ties (See: “Australia, India to Hold First Ever Naval Exercise Amid China Concerns”). Reflecting on these developments, Sibal said that India’s greater enthusiasm to participate in such exercises was testament to the changing security environment. “Until a few years ago, it would not have been easy to imagine India to be a part of quad, or for that matter, even trilateral arrangements between the United States, Japan and India,” Sibal said. A big part of this, Sibal said, was China’s worrying assertiveness in the South China Sea, with policies which he described as “reckless” and a threat to freedom of navigation and overflight – a concern for India since 55 percent of its trade passes through those waters. That said, Sibal also noted several challenges should the quad continue to take shape in the coming years. On China, Sibal said that the difficult task for the four nations would be to continue to maintain strong economic ties with Beijing for their own benefit while also challenging its assertiveness. China, he stressed, realizes this and is continuing to roll out new economic initiatives while also slowly testing Washington’s resolve in the security realm without triggering an all-out military clash. “China is playing a game of brinksmanship, and, unfortunately, succeeding,” he said. Sibal emphasized the need for the four countries to try to bring other partners – particularly the Association of Southeast Asian Nations (ASEAN) which is at the center of the emerging regional architecture – into the fold. “The quad should not allow itself to be put in a position where we are at variance with the broader thinking in ASEAN because ASEAN is playing a very central role in terms of Asian security,” he said.